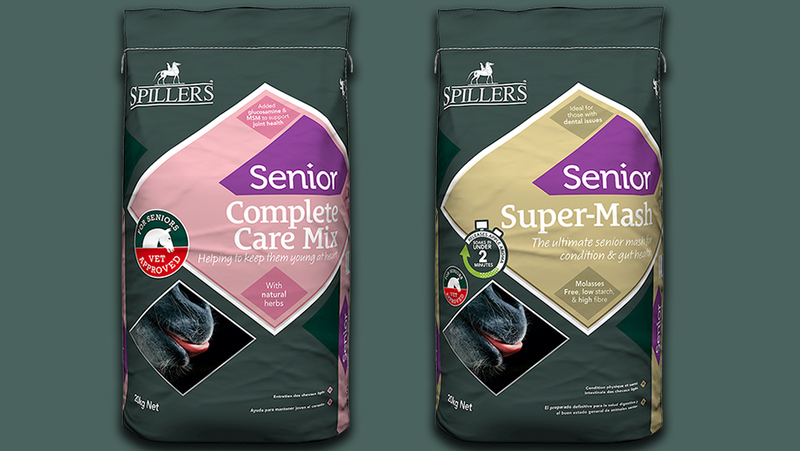 SPILLERS, known for its expertise in senior horse nutrition, is ensuring the nation’s much-loved seniors are completely cared for with the launch of two exciting new senior feeds: SPILLERS Senior Complete Care Mix and SPILLERS Senior Super-Mash. The company has also introduced a ‘Senior Friendly’ logo to clearly signpost other senior suitable SPILLERS products. For added piece of mind all have been veterinary approved, giving SPILLERS the first independently veterinary approved senior range on the market. SPILLERS Senior Complete Care Mix and SPILLERS Senior Super-Mash are the new flagships for the versatile SPILLERS portfolio of senior feeds, which also include SPILLERS Senior Conditioning Mix and SPILLERS Supple + Senior Balancer. The new SPILLERS Senior Complete Care Mix helps to keep precious seniors young at heart by supporting joints and digestion. It includes glucosamine and MSM for joints and pro and pre biotics to help support gut health, together with an irresistibly appetising blend of real herbs to encourage fussy feeders to tuck in. The new SPILLERS Senior Super-Mash is the ultimate senior mash for condition and gut health, ideal for those with dental issues and it soaks super-fast in less than two minutes. High in fibre and molasses free it also contains gut support from live yeast, MOS and FOS. SPILLERS has been researching the nutritional needs of the senior horse for almost 20 years. The brand has supported several PhDs and in the past four years has been involved with seven peer reviewed publications on various aspects of feeding and managing the senior horse, with more in the pipeline. Collaborative work is currently ongoing on the role of diet on tissue insulin resistance and the insulin response to an oral starch or sugar rich meal, as well as the gut microflora in the older horse. To celebrate the long-standing relationship with Redwings, SPILLERS is donating 30p for every bag of promotional stock sold to Redwings.